Melt margarine in large skillet over medium heat. Add turkey, bell pepper, onions, chipotle chiles, cumin, coriander, cinnamon and oregano; mix well. Cook 2 minutes or until turkey is thoroughly heated and vegetables are crisp-tender. 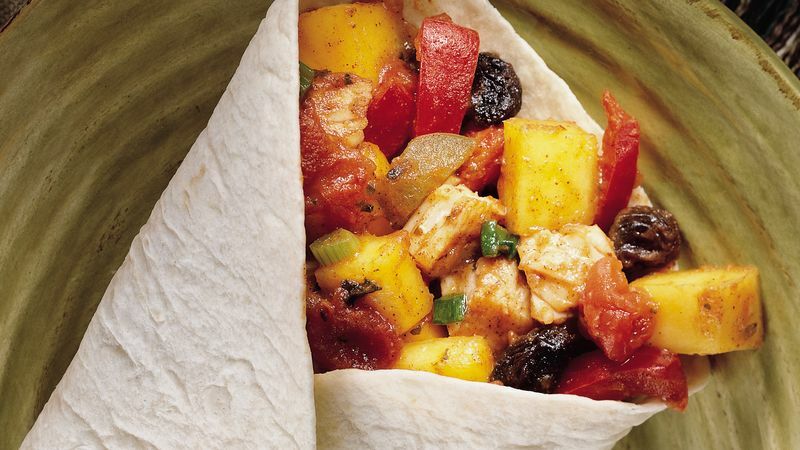 Add mango, salsa and raisins; mix well. Reduce heat to low; cook 3 to 5 minutes or until thoroughly heated, stirring occasionally. Meanwhile, heat tortillas as directed on package. Spoon turkey mixture onto warm tortillas; roll up. * One 10.5-oz. pkg. (12-count) Old El Paso® Flour Tortillas for Soft Tacos & Fajitas or 1 (4.6-oz.) pkg. (12-count) Old El Paso® Taco Shells can be substituted for the larger tortillas.